Private Lakefront Luxury Log Cabin with Outdoor Hottub! Welcome to the great escape! This property can best be described as "in the middle of nowhere, but with all the comforts of home, and then some". This well appointed log cabin sits 100' back from the shores of Locke Pond in Chesterville Maine. The home has 170' of private frontage, but no nearby lots are developed so you have complete seclusion from the world at this house. If a car drives past the access road to this house, then that could be considered a busy day. This home is ideal for families who love camping, but are not all that fond of sleeping on the ground. There is a tent platform provided, sitting 25' back from the water. 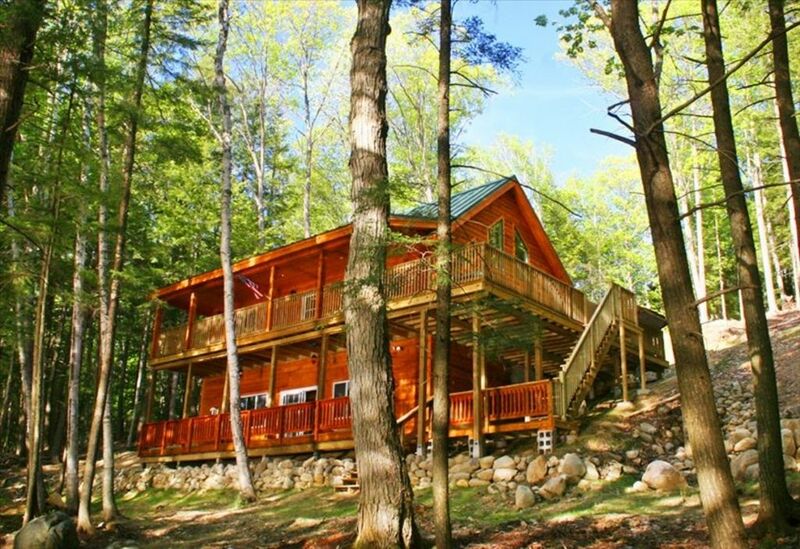 This cabin faces west over Locke Pond, providing beautiful sunsets on a regular basis. There is a large dock (20' long) to access the water from, and the swimming area is raked and cleaned annually. The swimming area is sandy and rocky, typical Maine, bring your sandals! The water is about 5' deep at the end of the dock, perfect for diving and cannonballs. There is also a swim float about 100' offshore for your enjoyment. At the shore you'll find a canoe, and two kayaks all for your use at no extra charge. There are no weeds in the swim area. The house itself is 2800 sq ft with 1200 sq ft of deck space. On the top deck is a 6 man hot tub, patio furniture, outdoor table and porch swing facing west. Make sure you turn off all the lights, jump in the hot tub on a clear dark evening and spend some time stargazing, the skies are incredible! The front deck is covered, perfect for enjoying a cup of coffee on those occasional quiet rainy mornings. On the main deck is a gas grill and table area, perfect for watching sunsets and listening to the loons. Most of the interior furniture has been hand built by a local artisan, you'll just fall in love with his work. The kitchen is completely filled with all you'll need to enjoy your week, pots, pans, skillet, coffee maker, toaster, dishwasher, fridge, freezer, ice maker, blender, etc... There are 4 LCD TVs wall mounted throughout the house along. Clean sheets and linens are provided as well as a washer and dryer. To be very clear, this house is NOT in a tourist area, this house is a grand escape from the hustle and bustle of everyday life, that's the beauty of it. If you're not comfortable with being one with nature and need ice cream stands and go-cart racing, then this house is not for you. This house is unique among other rentals, you can't see a neighbor on any side of the house, the only houses visible are across the lake from the shoreline. Worry not, civilization, downtown Farmington, is only 20 minutes away with restaurants, golf, yes, an ice cream stand, a cinema, Walmart, and quaint college shops. The ITS snowmobile trails pass right by Locke Pond, which are fun to mountain bike and hike on. Locke pond is generally a very peaceful quiet area, we ask that our guests respect this. The house has been built on the side of a hill, but grades off nicely between the house and the lake, the last few feet to the lake drop off quick, so we've built stairs to access the lake. Also, the driveway is quite steep, you will not be able to get in and out with rear wheel drive, you'll need 4-wheel drive or front-wheel drive to get in and out. You can always just park at the top of the driveway and walk the last 100' to the house. The lake is a quiet gem in central Maine. Locke pond is almost one mile long by 1/2 mile wide. It is 135 acres total area and 20' at it's deepest. Guests can bring up to a 25-horsepower motorboat, but no larger. There are no jet boats or jet skis on this lake. There is no public launch, so you must be able to carry your boat to launch it. In the autumn, the foliage from the swamp maples is simply dramatic, some of the prettiest foliage you'll see outside of the lakes region of New Hampshire. The lake holds a good fishery of warm water species, large mouth bass, perch, sunfish and pickerel. Most folks on the lake catch and release their bass to preserve the fishery, but there are no regulations requiring that. Locke pond is about 3.5 hours from Boston. Driveway is VERY steep. DO NOT GO DOWN UNLESS YOU HAVE A 4x4 or AWD!! Recently installed Hi-Def for the living room and basement sports room. Rich is a great host! The cabin on Locke Pond is a great location and cabin. This is our second time coming up for an extended long weekend in the fall and we absolutely love the cabin. If you are looking for a nice quiet lakeside escape from the hustle and bustle in the great woods of Maine then this is the place to go!! Thanks again for having a great spot and being such a great host Rich!! Beautiful cabin! Our favorite vacation place! We love Maine, it is hands down our favorite place to vacation & this is the third time we've stayed at this beautiful cabin. The owners have thought of everything & go above & beyond to accommodate your needs. We love the remoteness & quiet of this wonderful place. When we did leave to get groceries or shopping it's a short drive away. The addition of the pontoon made our stay this time, even if the fish weren't biting just lounging out on the water was so relaxing. Even on rainy days there's so much to do, playing ping pong or board games or just reading a book on the porch with he loons calling. Everything about this place rejuvenates us to go back & face real life. Thanks again for sharing your beautiful home with us! Wonderful, private area. Perfect to relax and reconnect! Rich’s cabin was exactly as described, and exactly what we wanted. The pontoon boat was worth every penny if available. Very private and quiet, especially for peak season. The lake is very clean, perfect for swimming. The kids loved it. Seemed like we had the lake to ourselves, very few people on the water. Take a trip to Phippsburg and check out Fort Popham, it’s worth the drive. Take a cruise with fish n trips charters, leaves from the pier at the fort, we did. The driveway is a bit steep with a bend but wasn’t an issue at all in a rav 4 so..., just take it slow. Ok, as for the fishing. It was pretty good, large mouth bass, pickerel, yellow perch, and pumpkin seed sunfish were the species we caught. We highly recommend this property and hope to come back. What a great house and boat. We had a blast all week long. Beautiful house, quiet and peaceful area. Perfect vacation. Kids enjoyed kayaking, canoeing, fishing and swimming. Loved having campfires and relaxing in the hot tub. Definitely would love to come back next year!! For partial weeks during Pre/Post/Off season use/cost of hot tub will be negotiated Rates do not include 9.0% Maine state sales tax and $400 security deposit. If you want use of the paddle boat I can have it delivered for $75.